Capitol Historical Artifact Collection, State Preservation Board. 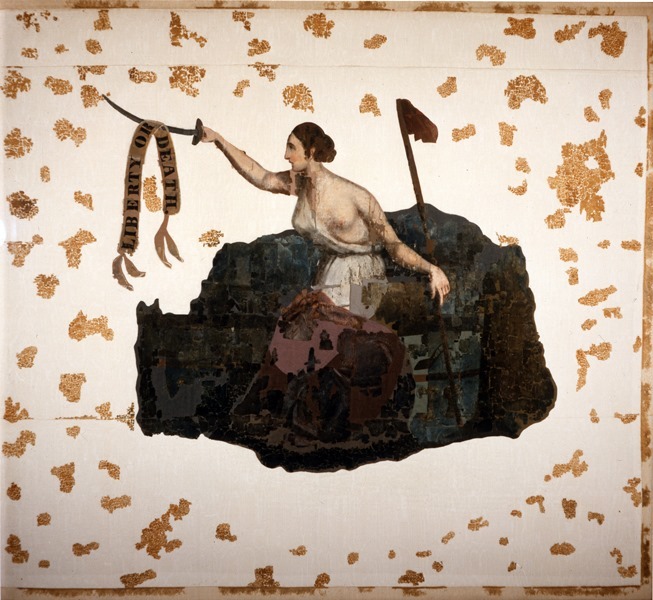 Texans carried this silk flag at the Battle of San Jacinto on April 21, 1836. Historians believe the banner is the only Texas battle flag at the final conflict of the Texas Revolution. 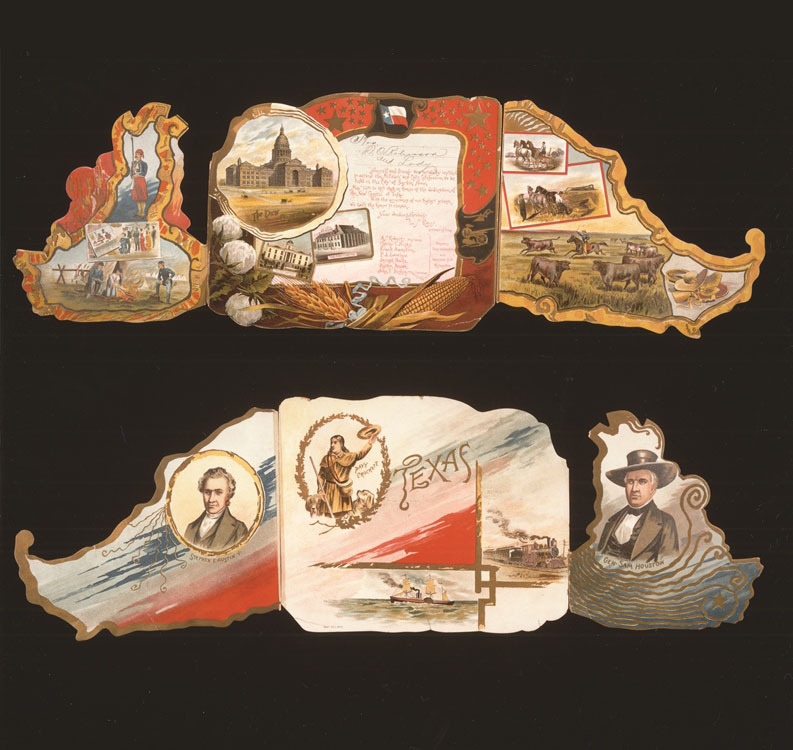 Artist James Henry Beard likely painted the flag in late 1835 as a gift for the Newport Rifles, a 52-man company of Kentucky volunteers led by Captain Sidney Sherman. 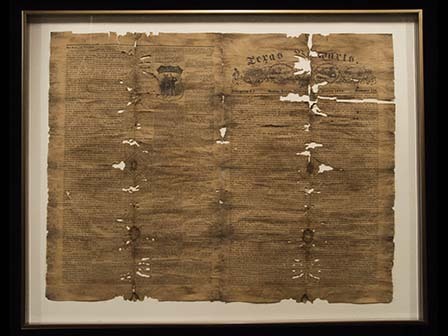 In 1896, Sherman's descendants presented the tattered silk to Texas. 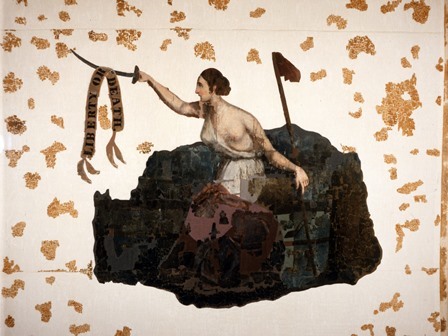 The flag has received conservation treatment on two occasions including in 1990 by renowned flag conservator Fonda Thomsen. The banner hangs behind the podium used by the Speaker of the House of Representatives. To aid in the preservation of this important artifact, a replica stands in its place when the legislature is not in session. 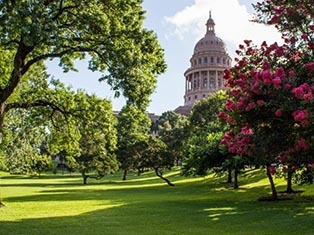 Likely inspired by the statue of Freedom on top of the U.S. Capitol, architect Elijah Myers designed the Goddess of Liberty as the crowning element of the Texas Capitol. Working in the Capitol basement, metal contractors welded over 80 pieces of zinc to form statue. The Goddess probably received three coats of white paint and sand to simulate stone. 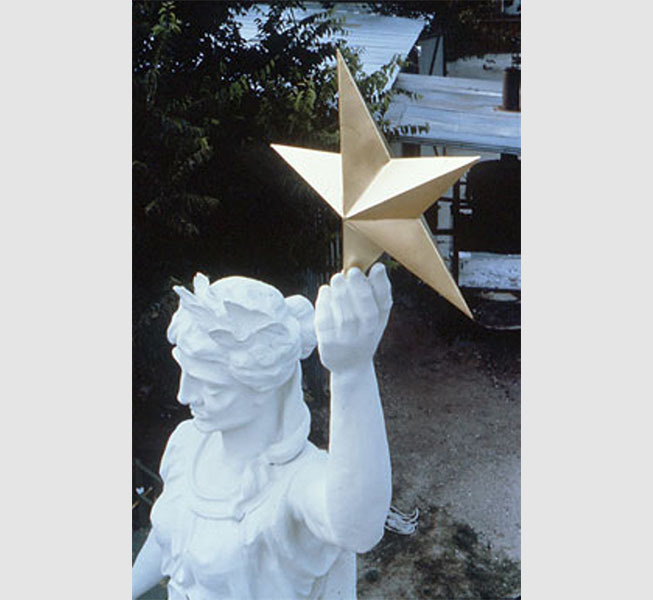 Workers likely later gilded her original lone star. 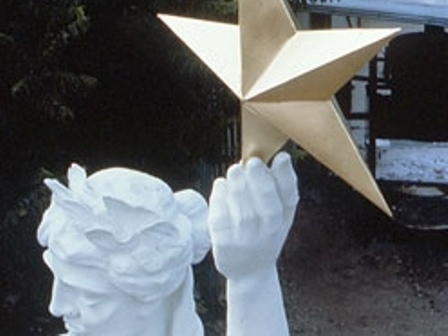 A replica statue was constructed and placed on the Capitol in 1986. 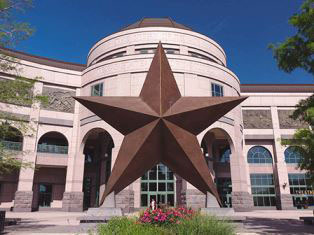 The original Goddess is on display in the Bullock Texas State History Museum. 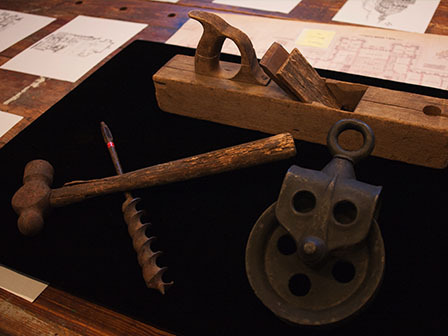 Tools used for Goddess of Liberty. In late February 1888, workers hoisted the Goddess of Liberty in four separate sections and assembled her atop the Capitol. 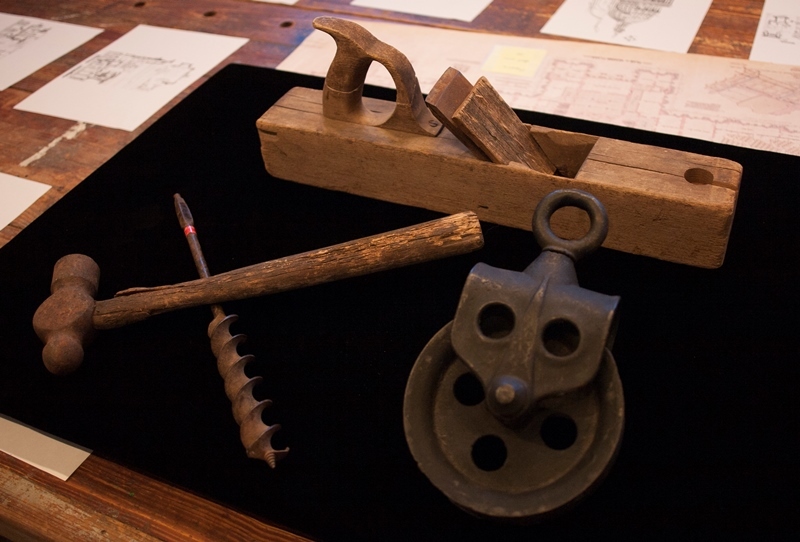 These tools were used by C.W. Carlson, the foreman of the crew who placed the Goddess on the dome. Preservationists discovered a time capsule in the star of the 1888 Goddess of Liberty. 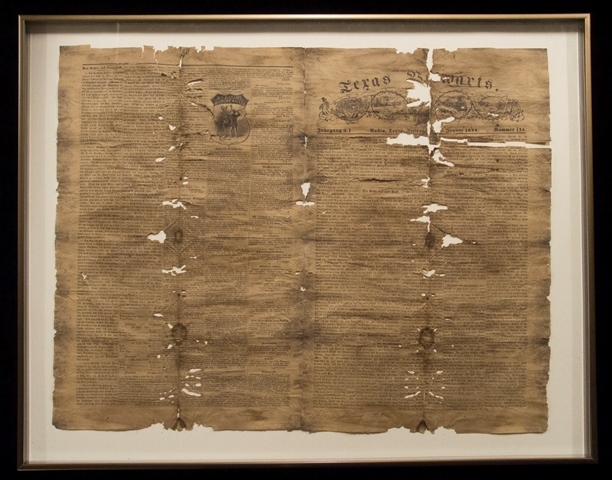 The time capsule included this German language newspaper, calling cards, two Wisconsin newspapers and a broadside. 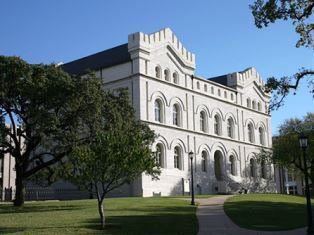 Staff at the Harry Ransom Humanities Research Center at the University of Texas at Austin conserved the objects. Ed Shutze, whose father published Texas Vorwaerts in Austin, placed the newspaper in the star. 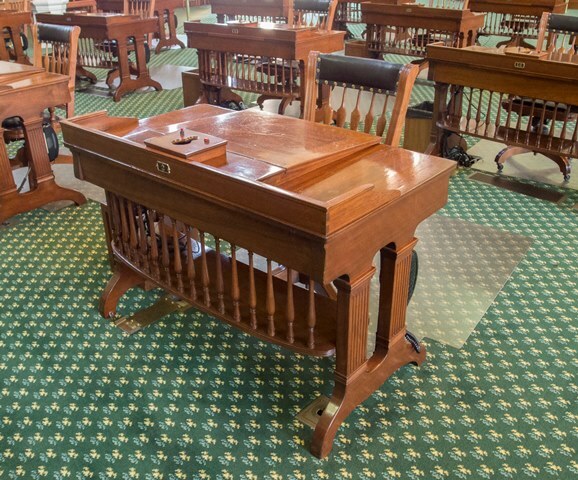 In November 1888, Texas awarded the contract for wood furnishings for the Capitol to A.H. Andrews and Company. Based in Chicago, the leading manufacturing center in the country, Andrews produced a wide variety of furnishings. 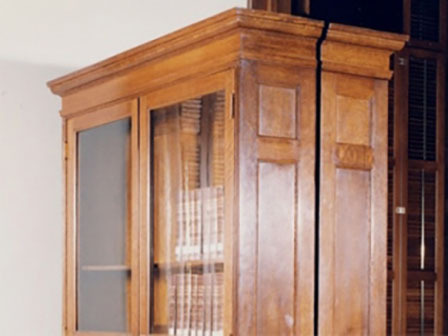 The Capitol received at least three sizes of double-door glass bookcases with a two-drawer base bookcase. 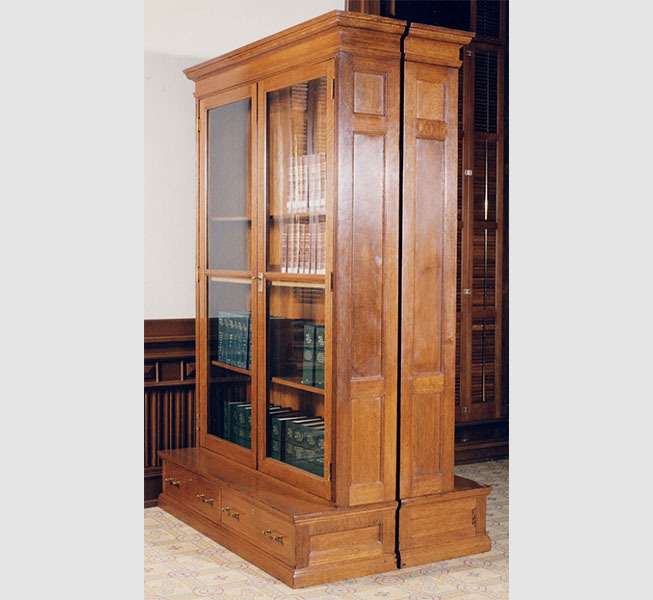 The Capitol Historical Artifact Collection has examples of all three including this largest version in the Legislative Reference Library. 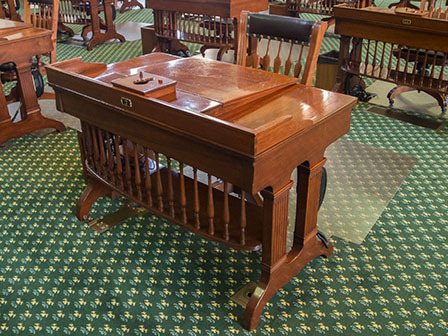 Senators use the original walnut desks purchased for the Chamber. 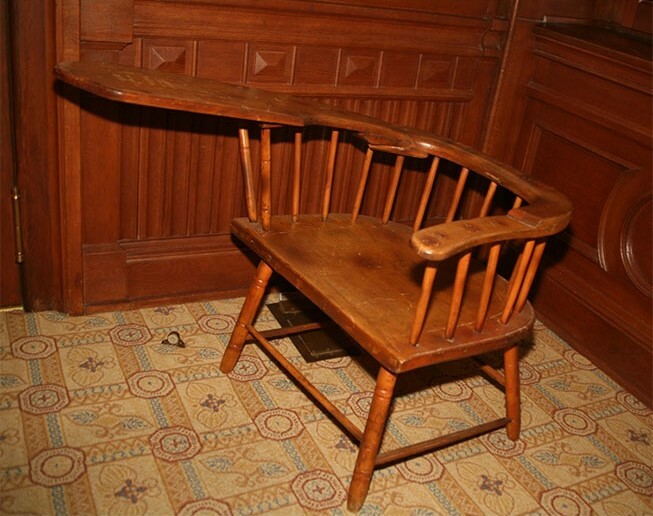 The A.H. Andrews and Company of Chicago, the leading the leading manufacturer of office furniture at the time, made the desks. The desks received a refinishing as part of the 1990s Restoration. The additions of microphones and telephones have been the only modifications. The telephones attach on the side, avoiding alteration to the desks' original appearance. 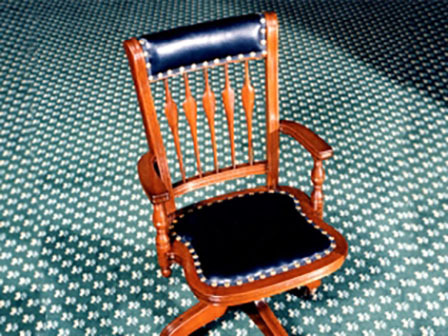 Several examples of the original members' chairs remain at the Capitol. 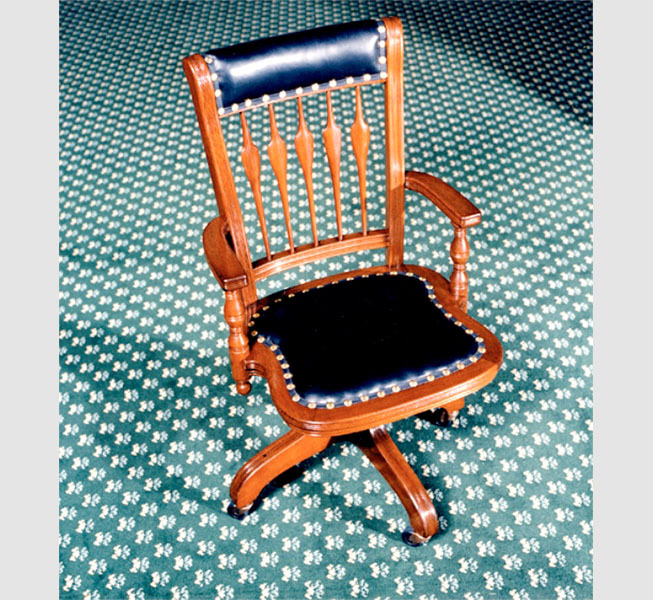 Chairs for the House of Representatives Chamber featured this oak style while those in the Senate Chamber were made of walnut. Members used these chairs until the 1940s and they have been restored to their original horse-hair stuffed, black leather upholstery and canvas gimp with brass daisy-head nail trim. The furniture contractor A. H. Andrews and Company purchased the chairs from the Milwaukee Chair Company. 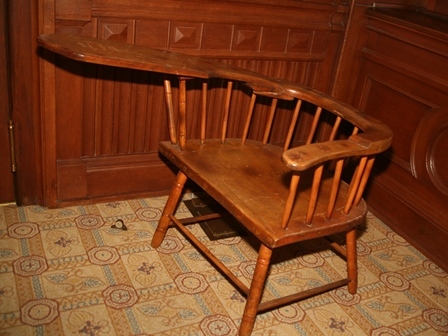 The swivel mechanisms of the chairs include the stamp "Milwaukee Chair Co."
The simple desk-like chair currently stands in the Legislative Reference Library. Mexican General Antonio López de Santa Anna reportedly used it following his capture after the Battle of San Jacinto. Santa Anna wrote from the desk during his imprisonment at the home of Dr. James Phelps. The descendants of Dr. Phelps donated the "Santa Anna chair" to the State Library, which was once housed on the second floor of the Capitol. 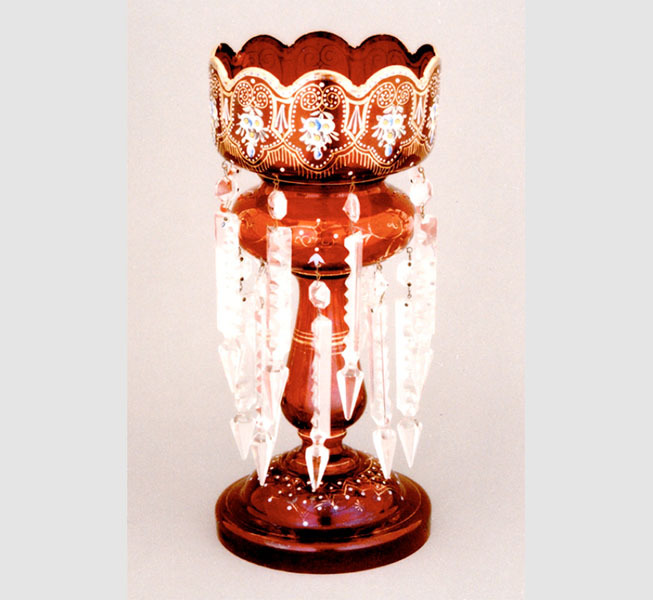 The pair of ruby glass lusters feature two rows of cut prisms. Each has a scalloped bowl, which sits atop a pedestal. 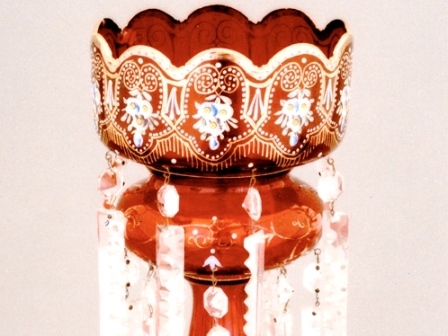 The bowl has an enameled floral and gold design. The piece dates from around 1880 reflecting the popular Victorian decorative taste when the Capitol first opened. Spittoons or cuspidors were common during the Capitol's early years when gentlemen needed to discreetly discard their tobacco products. 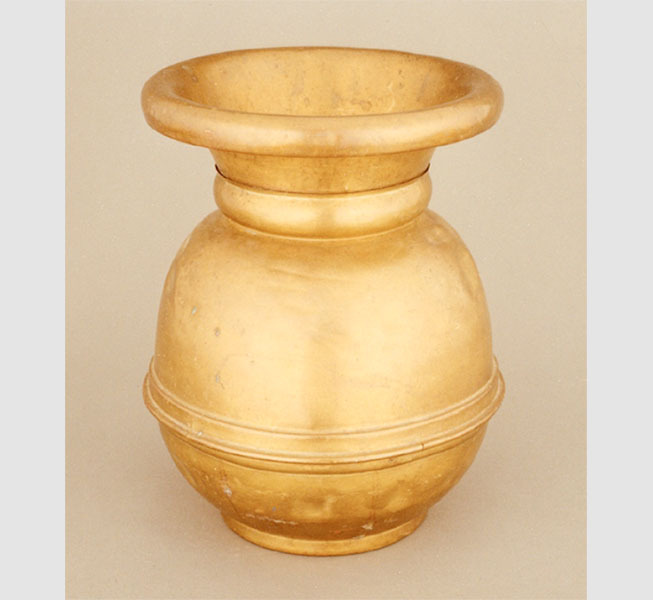 Justices in the Capitol Supreme Courtroom used his brass spittoon. 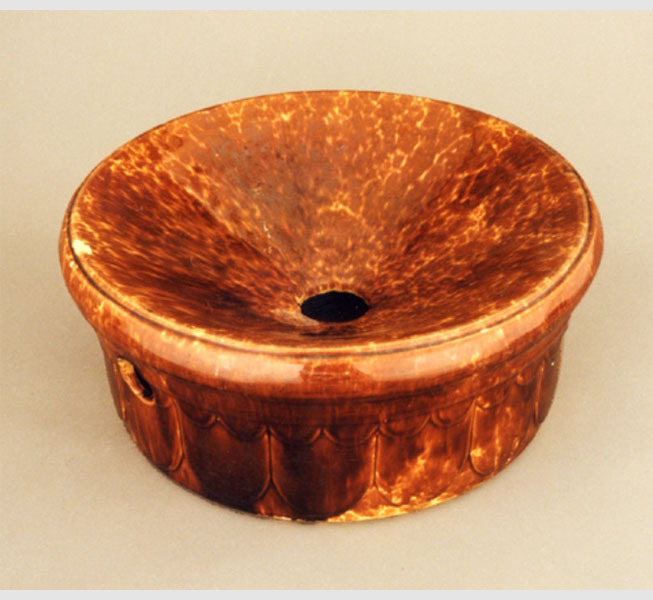 Spittoons or cuspidors were common during the Capitol's early years when gentlemen needed to discreetly discard their tobacco products. 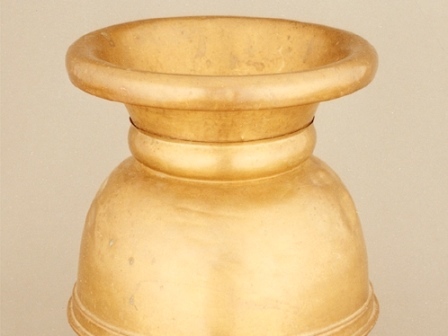 The only ceramic spittoon in Capitol collection dates to c. 1880. 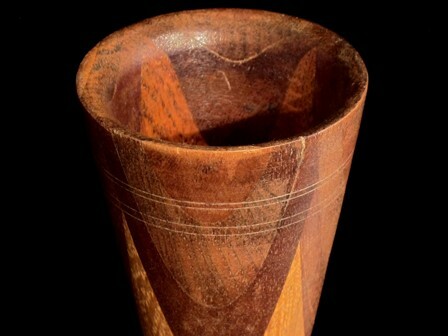 The unique color and sheen is probably the result of a two-part glaze of mottled brown slip over yellow. This glaze formula, known as "Rockingham," originated in England. The 53-piece set depicts Texas bluebonnets and wildflowers. Displayed in the Lieutenant Governor's Reception Room it is the only known complete set in existence. The famous English china manufacturer Wedgewood created the set to commemorate the 1936 Texas Centennial. An unknown group placed the initial order in May 1935 via the New York office under the management of Kennard L. Wedgwood. 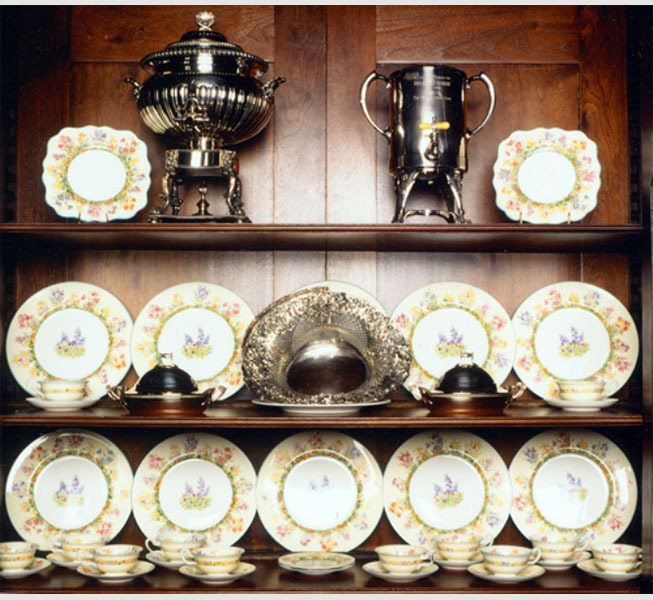 E. Overton Jones, a Wedgwood salesman in the 1930s, designed the pattern and Neiman Marcus exclusively sold the set. 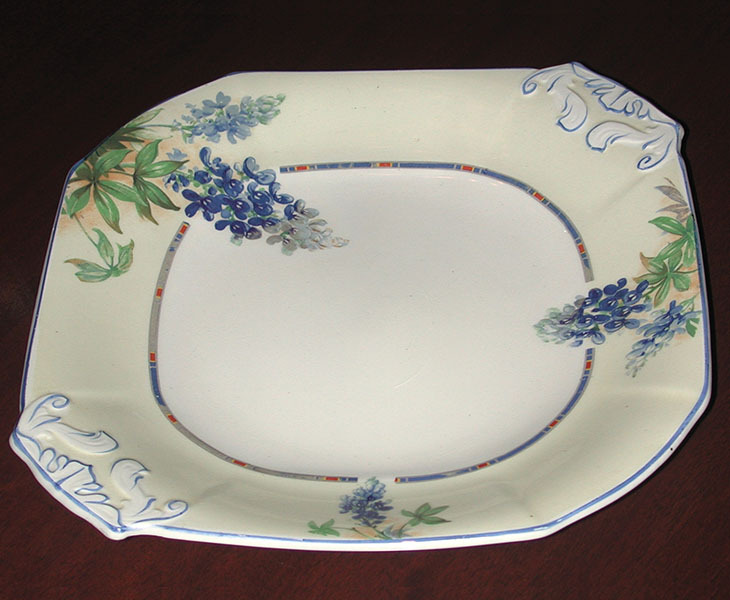 The 75-piece English porcelain set of china features bluebonnets, the state flower of Texas. It is on display in the dining room of the Speaker of the House of Representatives Apartment. W. H. Grindley and Co., Ltd. manufactured the set. Purchased as a wedding gift from the Kooch Company, a store then located on South Congress Avenue in Austin, it dates to 1928. 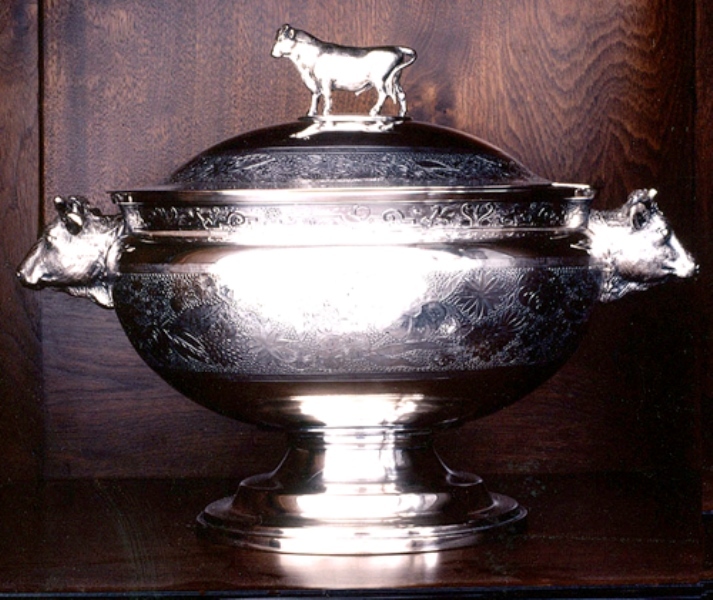 The silverplate American soup tureen features steer's head handles and a steer finial. Reed & Barton made this piece c. 1865 and it is displayed in the Lieutenant Governor's Reception Room. 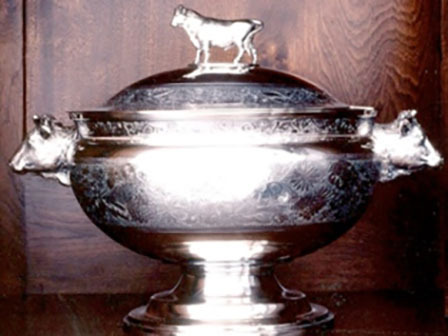 The word tureen comes from the French terrine, a large earthenware pot for soup or stew. 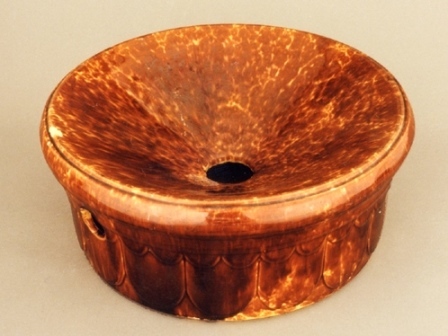 Circular or oval in shape with a lid, the earliest examples date from the 1720s, but they were more common later. 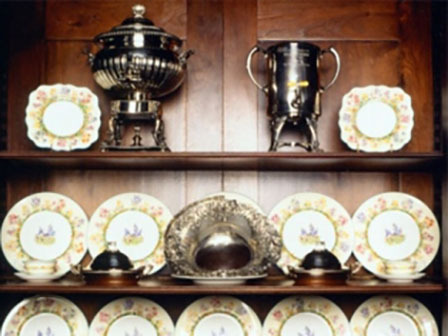 The size and shape of dish gave silversmiths space to fashion them in many styles. 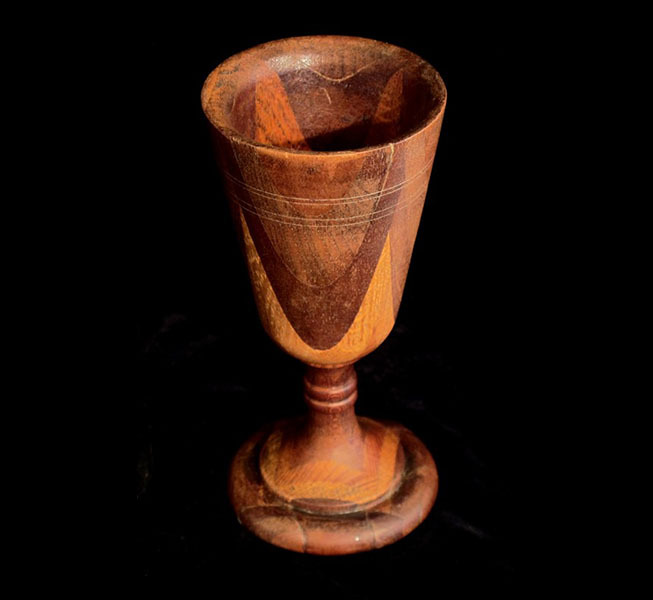 The wood goblet was one of the many unique souvenirs available for purchase during the Capitol's dedication in May 1888. 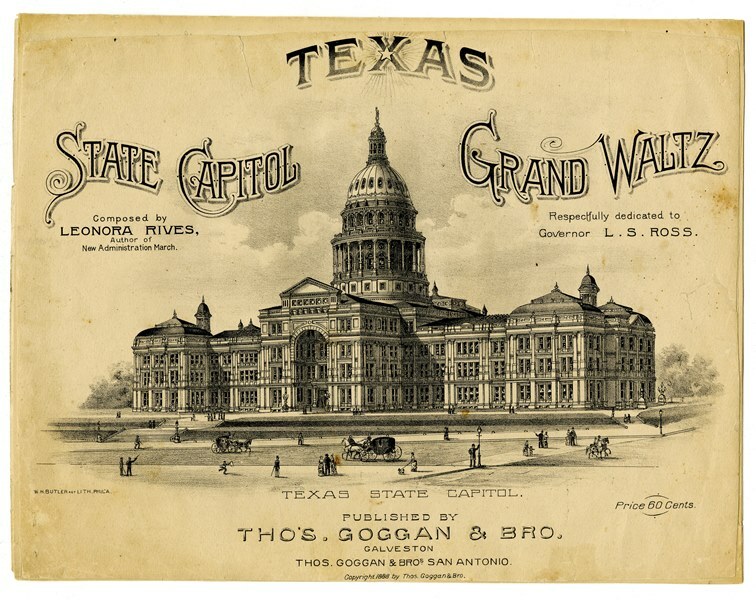 The label on the bottom reads, "This is to Certify that this SOUVENIR is Manufactured from the Remnants of the Lumber used for Finishing the Interior of the TEXAS STATE CAPITOL." W. J. Morgan and Company Lithographers of Cleveland issued this lithograph in 1885 during construction of the Capitol. Charles N. McLaughlin copyrighted the image based on the watercolor done by architect Elijah Myers. 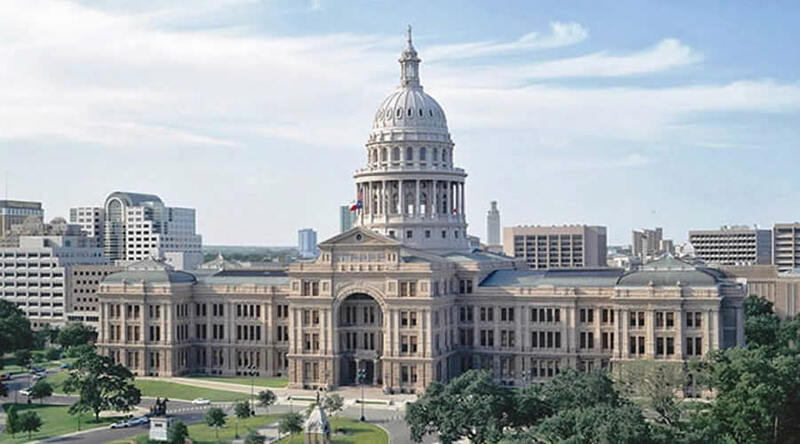 The work features a more elaborate façade than the as-built Capitol due to the change in building material from limestone to Sunset Red Granite. The lithograph features well-known Texans as well as depictions of the Alamo and the first Capitol of the Republic of Texas in Houston. 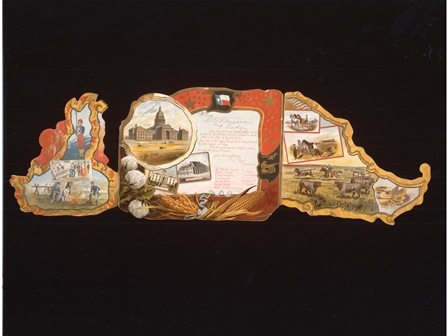 The Honorable D. C. Robinson received this Texas-shaped invitation. 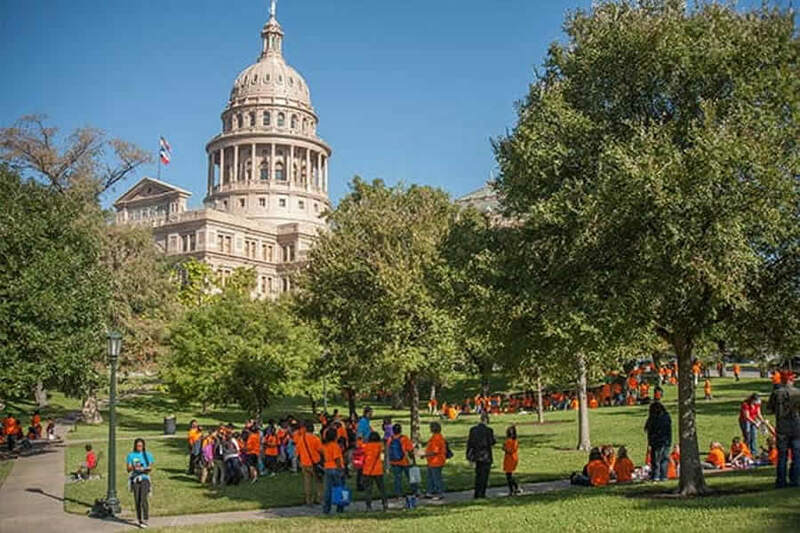 It invited Robison and Lady to attend the military and civic celebration to dedicate the new Capitol of Texas from May 14th to May 19th 1888. 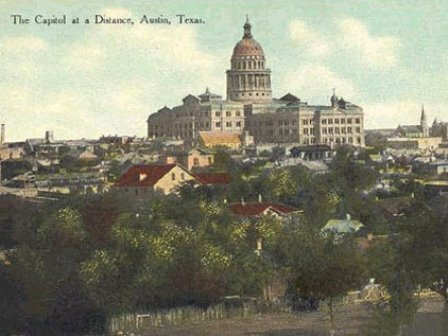 The invitation probably belonged to David C. Robinson, House of Representatives Member from San Antonio during the 20th and 21st Legislatures. 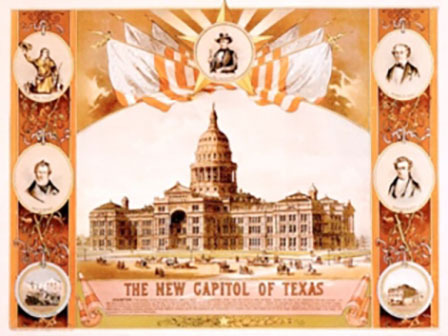 The elaborate color invitation depicts the new Capitol, previous statehouses, renowned Texans, agriculture and ranching. 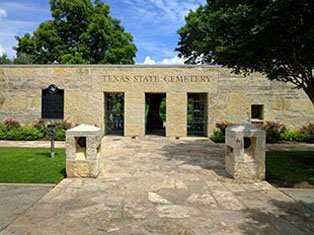 Courtesy Texas State Library and Archives Commission, 1992/23-2. 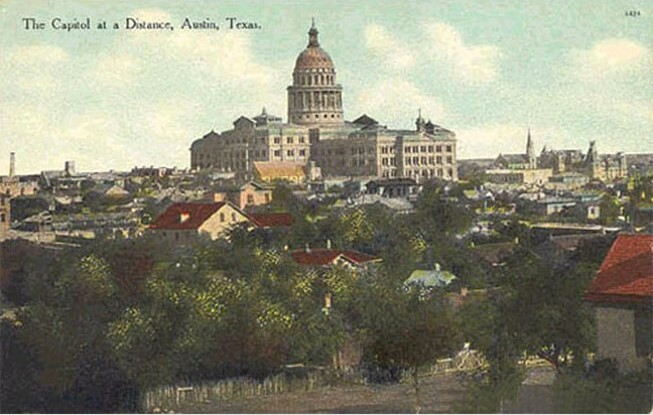 Over 20,000 people attended the week of festivities to dedicate the new Capitol in May 1888. 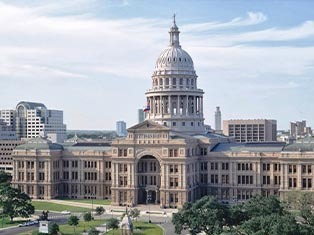 Leonora Rives-Diaz, a pianist from South Texas, composed a special “State Capitol Grand Waltz” for the dedication. 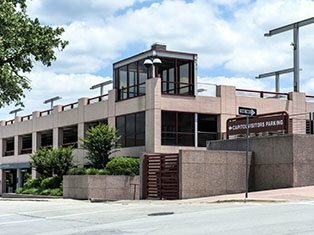 The Austin Daily Statesman printed 10,000 copies that they gave away in only a few hours. 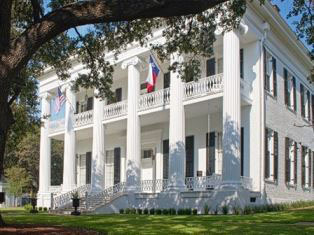 Images Courtesy Texas State Library and Archives Commission 1997/1-15-1. 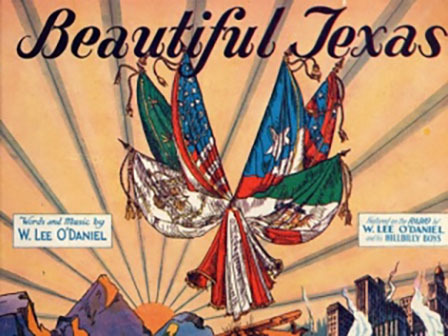 W. Lee "Pappy" O'Daniel wrote the words and music for Beautiful Texas in 1934, four years before he become governor. 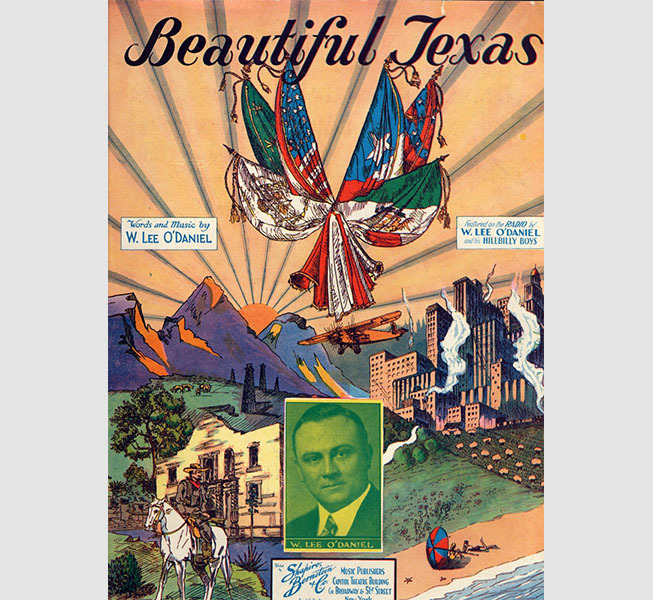 One of the most colorful figures in Texas history, O'Daniel began his career as a flour salesman. Recognizing the influence of radio, he started and hosted a country music program to promote the product. He organized a band called the Light Crust Doughboys. Many famous Western Swing musicians, including Bob Wills, got their start in the band. Urged by his numerous radio fans, "Pappy" ran for governor and won a landslide victory in 1938. This c. 1907 lithograph postcard depicts the northwest facade of the Texas Capitol, which makes it a unique image. Photographers from that era tended to focus on the south entrance to the Capitol. Only a handful of images from the Capitol's early years survive documenting other facades of the building.